Slaters might be welcome in the garden but sometimes they over step the mark and invade your home! You’re more likely to find slaters coming into the house into autumn when the temperatures start to drop or during dry, warm periods when they are searching for moisture. If you find slaters in your home it can be an early warning sign that you may have a source of damp in and around your house. Slaters need moisture to survive, so you must remedy any source of dampness to get control of a slater numbers. At the same time, you should seal any cracks and crevices in the building to stop slaters invading from outside. Slaters can be found throughout the world. This might explain why they have so many names. Some of the more common names include pill bugs, roly polys and woodlice. In Australia and New Zealand they’re known as slaters. They look a bit like small armadillos (and are sometimes referred to as the armadillo bug), but they’re neither mammal nor insect. Like lobsters, crabs and prawns, they’re a crustacean and breathe through a type of gill system similar to fish. This is why they need a source of water (or damp) to survive. Slaters are not harmful to humans, but if numbers are allowed to grow they can become a nuisance. WHY DO SLATERS COME INTO MY HOME? During warmer months, slaters will come into the home during dry periods looking for moisture, although if there are large numbers outside, they can also come in by accident. When temperatures drop they may also make a dash for warmer lodgings. They prefer warm and damp conditions. With little legs it might take them a while, but slaters can roam anywhere in your home. As a homeowner you’ll most likely come across them in ground floor rooms or within the sub-floor (if you have one). HOW DO SLATERS GET INTO MY HOME? Garden beds, especially those with warm, damp, wood mulch, are a perfect habitat for slaters. If they’re next to the house it’s not a long journey for them to find their way into your home. As with other similar sized pests (usually no more than 15mm in length) they gain entry to your home through cracks and crevices in the building, through weep holes, air vents, and gaps around exterior pipework. HOW TO KEEP SLATERS OUT OF YOUR HOME? Move garden beds away from the house. If you have a garden bed next to the house, use pebbles and NOT a plant-based mulch. Keep plant watering to a minimum (slaters like moist conditions). Seal all cracks and crevices around the property perimeter. Make sure doors fit well and attach draft excluders to minimise any gaps. Eliminate damp areas in and under your home with better ventilation, or heating (to dry out areas of damp). Stop leaking taps or water dripping through worktops around sink units, shower bases and baths. Make sure you give any outdoor taps an extra twist to stop them dripping. 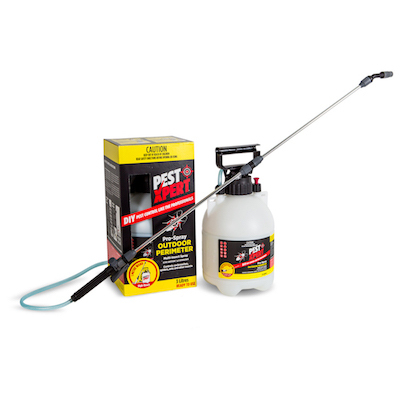 Carry out a perimeter spray with an insecticide (such as PestXpert Outdoor Perimeter), focusing on good coverage at ground level, over flower beds and around potential entry points. Insecticide sprays such as PestXpert Pro-Spray Crawling are very effective in killing slaters. It’s a great option for direct spray onto slaters and with its extendable nozzle it’s the best option for longer lasting residual control around the perimeter of your home and outside entry points. For more information visit our pest centre page dedicated to slaters.